The reception at the door is entrusted to a massive Scottish suit of armor, the true symbol of this eclectic disco-pub. The interiors are pretty spacious, with a good number of comfortable tables, at an adequate distance between each other. One of our strengths is definitely our incredibly long and beautiful bar, behind which our bartenders like to juggle and show off their amazing acrobatics, all while serving you some of the best cocktails and beers in the city. The lights are dimmed, the interior is all wood and the atmosphere is always warm and cozy, in perfect Scottish pub style. The pub is always open, all day, everyday, until late at night. We serve quick meals at lunchtime to accommodate the needs of the many offices in our area, tea time at 5 pm – with hot chocolates and flavored teas – aperitivo, happy hour, dinner and even after dinner. At the Nag’s Head it’s indeed possible to enjoy both a good drink and a good meal. 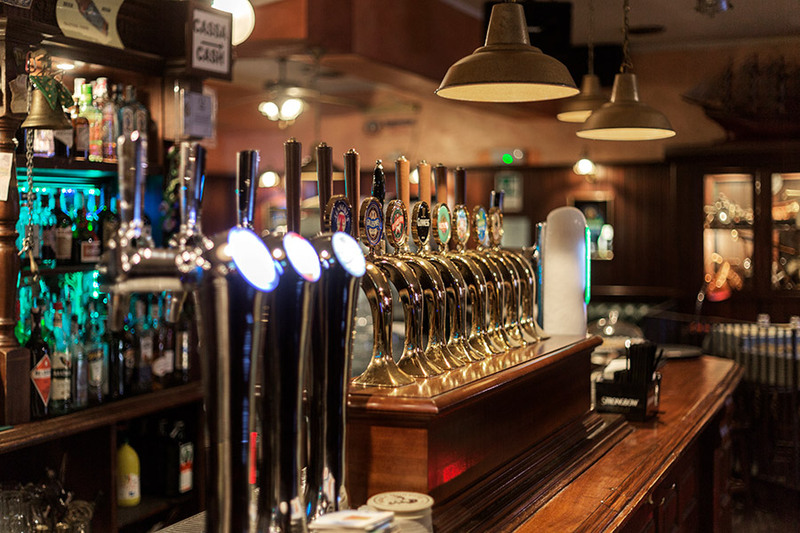 Our menu offers only the best quality beers (Carlsberg, Guinness, Devil’s Kiss, KilKenny, Heineken and many, many more), amazing cocktails of all kinds and a good selection of wines. As far as food goes, our vast choice allows you to pick between classic pub food, simpler pizzas, focaccia, salads and sandwiches, or even a full first and second course in case you want to have a bigger meal. Our weekly schedule is incredibly varied, ranging from live music during the week, to a straight up disco in the weekends, where it’s possible to dance to the beat of the best house and revival music, mixed by Rome’s hottest DJs. There’s also plenty of room for everyone on the dance floor. Lastly, it’s possible to enjoy all the soccer games – both italian and international – and other sports on pay-per-view on our maxi screens. Overall the Nag’s Head is a young and lively disco-pub, animated by an international and outgoing clientele who likes to get down and dirty on the dance floor at night, or party together over a good pint of beer. A pub in everyone’s reach where anyone can meet new people and have fun all together!